Lewis Hamilton delivered a faultless performance under the Marina Bay lights during Sunday’s Singapore Grand Prix, ceding the lead only briefly during the pit stops. Mercedes played a strategic masterstroke at a circuit widely expected to be one of their weakest, responding to Ferrari’s early pit stop for Sebastian Vettel and seizing the moment. The Scuderia gave their frontrunner the ultrasoft tyre, while Mercedes put their man on softs. Hamilton was going to be able to run to the end on a single stop, come what may, while Vettel spent the evening driving with the threat of a second pit stop and significant loss of track position hanging over his head. “It was a long race. That felt like the longest race of my life, so I’m glad it’s over. Max put up a good fight as well, but what a day, what a weekend. I feel super blessed,” said Hamilton after the race. A podium finish and a fifth-place would be cause for celebration for most teams, but for Ferrari the result of Sunday’s Singapore Grand Prix was tantamount to a disaster. The Marina Bay Street Circuit should have been one of the Scuderia’s strongest tracks, and recent seasons have shown it to be a weak point for the Silver Arrows. But the 2018 Singapore Grand Prix belonged to Lewis Hamilton, and Ferrari’s unusual pit and tyre strategies left Sebastian Vettel and Kimi Raikkonen playing catch-up all night long. 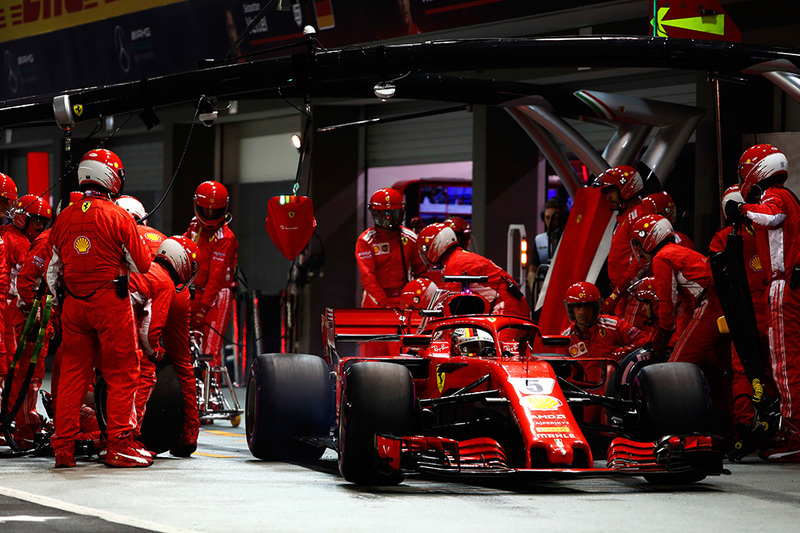 While there are six rounds remaining in the calendar, the Singapore Grand Prix may well turn out to be the race where Ferrari lost both championships. 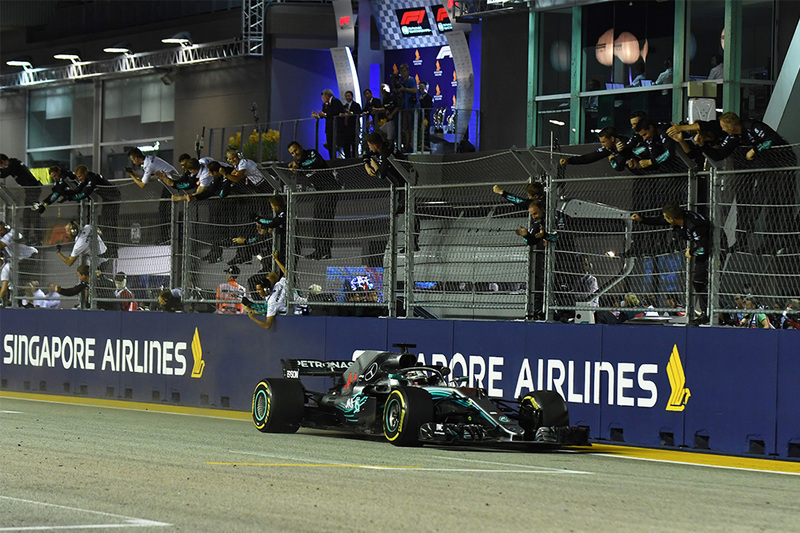 The close walls of the Marina Bay Street Circuit have led to at least one Safety Car at every edition of the Singapore Grand Prix. 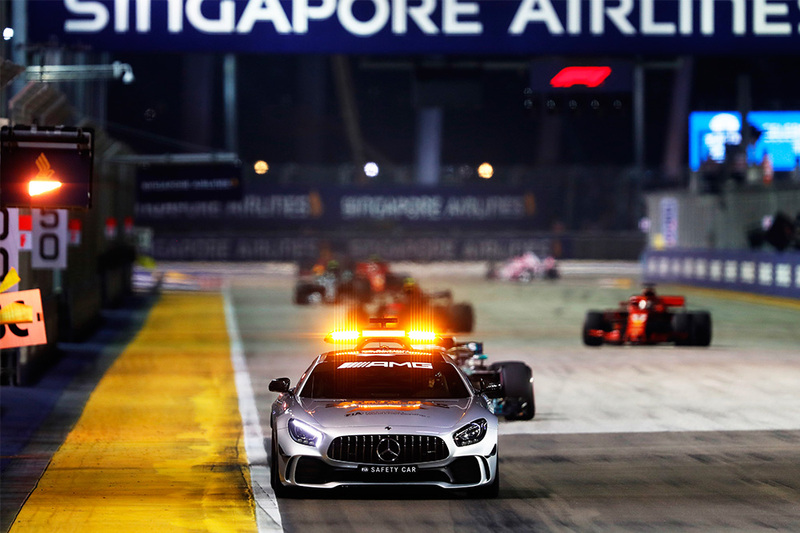 In recent years, the Safety Car has been deployed on track before the first racing lap is complete, and the 2018 edition of the race was no different. Racing Point Force India teammates Sergio Perez and Esteban Ocon were running side by side when the pair got too close for comfort. Ocon was in the wall, debris littered the track, and the Safety Car led the pack for the first four laps of Sunday’s race. The deployment was too early to have impacted the outcome of the grand prix, but it was a timely reminder to those left standing that Marina Bay is no place for silly games. "Sorry guys, there was no room, I basically did not even see him," said Perez after hitting teammate Ocon.